Inder Loves Folk Art: Frugal Sewing? : Thrifting fabrics. It is well known that I love to sew, and that I have quite the fabric habit, made worse by the fact that I prefer to shop at our locally-owned, independent fabric shops, which tend to have more unique and beautiful fabrics, with higher prices to match. Result: I have piles and piles of beautiful fabrics. But it's never enough, right? And while I have heaps of woven fabrics, I don't have very many knit fabrics, and, as you know, sewing knits is totally my new thing! Problem: We are on a very strict budget these days, trying to pay down our debt. I've been dutifully packing my lunch, making my own coffee, cooking at home, going to the library, cutting back on micro-brewed IPA consumption, and generally not shopping. But I have, just possibly, been spending just a teeny bit more than I should on fabric. (I blame Britex and their beautiful stock and crazy prices!) Let's just say, saving $2 on coffee doesn't make much of a difference if you're still spending $60 every time you even think about going to a fabric store, right? But I need more knits, so that I can continue to experiment! Poor Joe now has multiple outfits in day-glo orange and crazy orange-green stripes. I still have more of these fabrics (a yard of knit goes a long way in children's clothing! ), but when I see tutorials like this one (see that pile of pretty ribbings? ), I get all antsy. I need more, more, more! This is why people refer to themselves as fabric junkies. My greed for fabric far outstrips my ability to actually sew (this is why I have a huge stash, duh). Check out this haul! These are t-shirts and tank tops. Once you stop looking for actual clothing and start shopping for fabrics, there are seriously, so many options. I was able to pick out the softest, stretchiest knits (cotton/spandex mixes) and ribbed tanks (to use for ribbed necklines and cuffs), in the prettiest colors and stripes. And these are mostly large and extra-large adult-sized t-shirts - some of them will reap a yard or more! The blue striped fabric is a giant nightshirt that will provide a whole wardrobe. Now, I've always loved thrifting, and when I see beautiful vintage fabric or vintage sheets, I always pick them up. But in my hipster/working poor neighborhood, those items are pretty uncommon at thrift stores, as they tend to get picked up and resold. So our local thrift stores are fairly picked over - you're probably not going to find highly valuable antiques (or anything valuable, for that matter, although there is plenty of useful stuff) at the Salvation Army here. But nobody wants a size XXXL knit nightgown with a stretched out neck and a stain on the hem (but check out that gorgeous stripe)! So I think knits are especially suited for thrifting and upcycling because (a) they are so common and cheap (you can buy old t-shirts by the pound some places); (b) it's pretty easy to find shirts with few details (as opposed to clothing made from woven fabric, which is usually full of darts, pockets, plackets, and other details to work around); and (c) it's easy to find sizes XL, XXL, etc., which yield a ton of fabric. 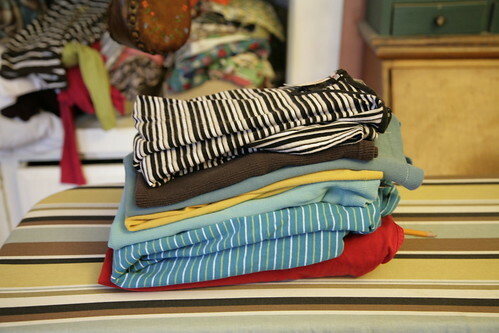 Plus, second-hand goods are probably greener than the nicest organic cotton "eco-fabric." What's better than growing organic cotton? Not having to grow any cotton at all (and diverting old stuff from the landfill). Needless to say, I don't plan to give up on new fabrics entirely. Haha. Not likely. But hey, every little bit counts, right? I also got a wearable blouse and sweater, some capris that I may cut off as shorts for myself, and a teal silk skirt that I plan to shorten and then wear every day, because it is that cute! - I'll post about that project later. All for $23! So I got my fix, for a lot less than my usual Britex bill. Uh oh. I may have a new addiction now. P.S. I know some people are skeeved out by used clothing. Well, I think folks should get over it. There's nothing (skeeve-wise) that a wash on hot can't fix. That is such a good idea. I tend towards the lovely pricey new stuff too. I'm going to look at op-shop t-shirts in a whole new light! great point about used clothes being greener--reuse rocks!